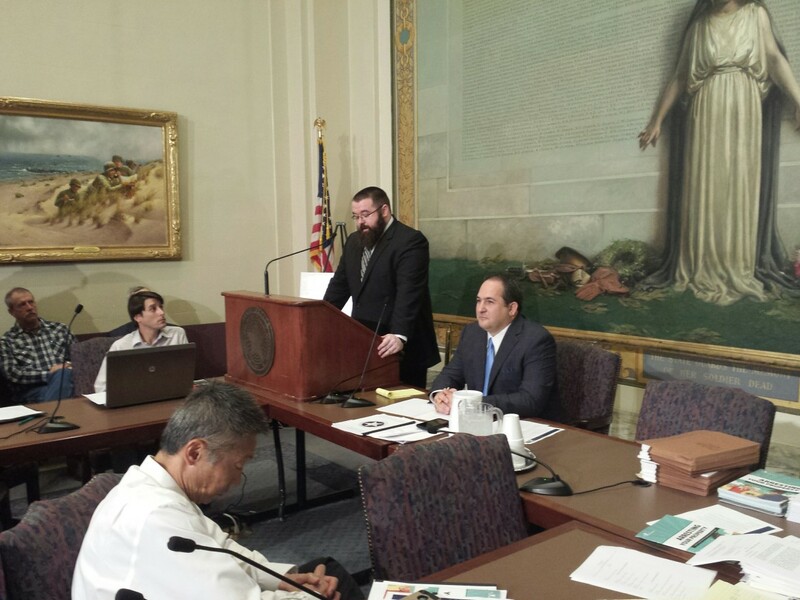 Cato Institute attorney Adam Bates testifies at a special hearing on civil asset forfeiture at the State Capitol. State Sen. Kyle Loveless is seated at his left. In one corner: both conservatives and liberals at the State Capitol, warning of the need to rein in the frequent seizures of people’s cash and property by law enforcement agencies. In the other: law enforcement officials and prosecutors at the Tulsa Police Training Academy, insisting they act responsibly and in the public interest in their confiscations of private assets as part of the war on drug traffickers. The dueling hearings occurred on the same day, Tuesday, underscoring the rift over legislation that would impose more limits on civil asset forfeiture. The practice has allowed city, county and state agencies to garner tens of millions of dollars in money and property over more than a decade. At the Capitol, the hearing was led by state Sen. Kyle Loveless, R-Oklahoma City, who has introduced Senate Bill 838 and who brought together experts of various political stripes. The message from most of them was similar: Law enforcement authorities have become too focused on reaping revenue from seizure operations in order to shore up their budgets, as opposed to just thwarting drug dealers. Adam Bates, an attorney for the conservative Cato Institute, expressed a similar view. “Self-financing plainly distorts the purpose of law enforcement,” he said. Also present were attorneys who represent individuals whose property or cash was seized. The attorneys said clients were afraid to come forward out of fear of retribution from law enforcement. University of Oklahoma Law School Professor Stephen Henderson said Oklahoma’s forfeiture laws are lagging those in other states in terms of assuring transparency to prevent government abuses involving the seizure of money. Ninety-plus miles away, in Tulsa, the declarations were equally adamant. The interim-study hearing was led by state Sen. Anthony Sykes, R-Moore, who chairs the Senate Judiciary Committee. Only those opposed to Loveless’ bill spoke. They included officials from police departments, sheriff’s offices, district attorneys’ offices, the Department of Public Safety and the Oklahoma Bureau of Narcotics and Dangerous Drugs. Their message: The Senate bill would cripple authorities’ ability to disrupt drug operations, that abuses of the system occur only rarely, and that the current system offers protection for citizens. Among other things, the bill would prohibit forfeiture without a conviction. Some of the speakers said the bill is an insult to the integrity of law enforcement officers. Tulsa Police Maj. Eric Dalgleish said the idea that law enforcement officers are “policing for profit is as accurate as insinuating legislating for profit. “I have yet to hear one case of (seizure and forfeiture) abuse of an Oklahoma resident,” Dalgleish said. The separate meetings were a source of controversy and confusion. On Aug. 26, Sykes decided to hold Loveless’ interim study hearing at the Tulsa Police Training Academy. That drew the ire of some lawmakers and members of the public because it was being held away from the Capitol and at a law enforcement facility. That evening, Sykes announced the interim study would still be held in Tulsa; those in favor of changes to the forfeiture laws were removed from the agenda. After Tuesday’s meeting, Sykes said the move was intended to encourage attendance from those who normally don’t get a chance to come to interim study hearings. Also, he said, construction on the Capitol might create noise that would interfere with the hearing. Brady Henderson, legal director for ACLU-Oklahoma and who spoke at the Oklahoma City meeting, said he had asked Sykes to also be placed on the Tulsa agenda to speak, but Sykes declined.